Many people would immediately dismiss choux pastry as too much of an indulgence. However, using reduced-fat spread and sweetener makes a huge dent in calories. With just a hint of chocolate and squirty cream, these are the ultimate in sweet treats. Preheat the oven to 190°C (fan 170°C/gas mark 5) and line a baking tray with baking parchment. 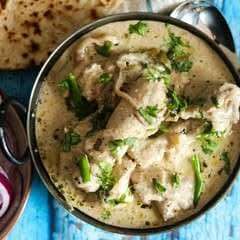 Put the granulated sweetener, salt, reduced-fat spread and water in a saucepan and bring to the boil. As soon as the mixture reaches the boil, take the pan off the heat and gradually beat in the flour. The mixture will look lumpy at first, but persevere. Continue to beat until the mixture forms a ball of dough and comes away from the sides of the saucepan. Add the eggs to the mixture and beat well to incorporate. It will look like the mixture has split at first, but continue to beat until it becomes glossy. Spoon the mixture into a piping bag fitted with a large nozzle. Pipe ten eclairs onto the lined baking tray (they'll be around 12cm/5in long each). Dab any 'tails' down with a wet finger and bake in the oven for 1 hour. DO NOT OPEN THE OVEN! Not even for a sneaky peek - they'll likely collapse and you'll end up with pancakes! 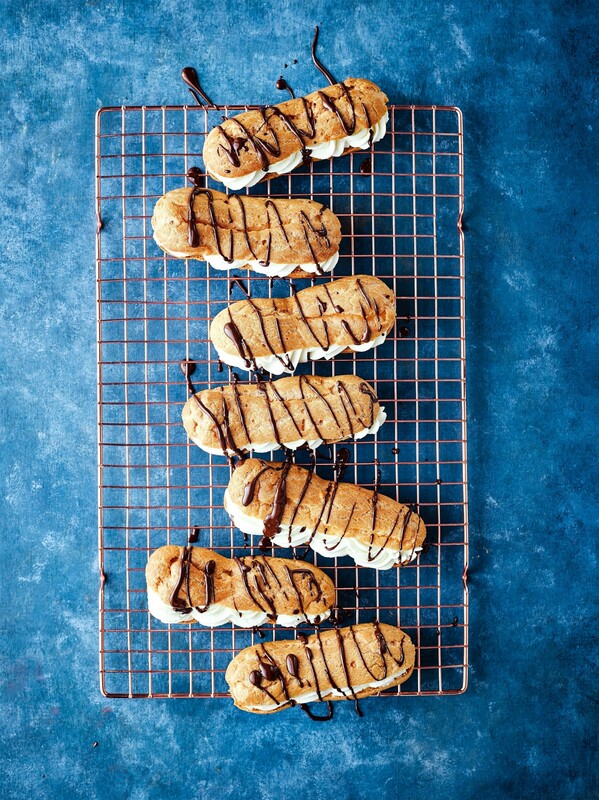 Once completely cool, cut lengthways through three-quarters of each eclair. Melt the chocolate chips in a bowl in the microwave. 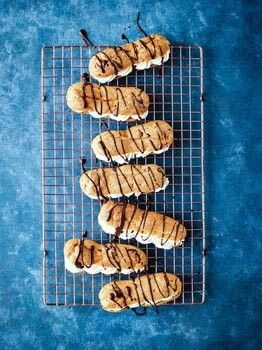 Squirt l tablespoon of reduced-fat aerosol cream into each split éclair and drizzle the melted chocolate over the tops. Serve immediately. Tip: You could bake the pastry buns in advance and freeze them. Simply defrost, fill and serve.